Even though we are just hours away from witnessing the launch of the Nexus Killer’s successor OnePlus 2, the handset will not be immediately to purchase, which is a straight blow for those of you who were anxiously waiting to purchase the smartphone. However, all hope is not lost because the device will be available to purchase very soon. 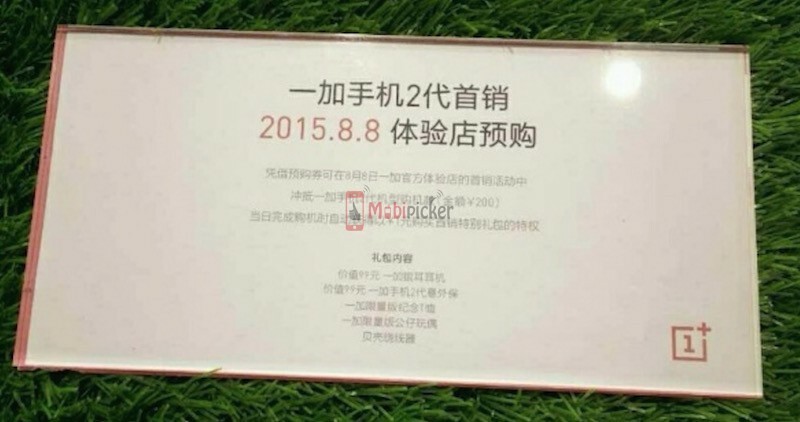 According to a source, August 8 will be the date when OnePlus 2 will be available to purchase from the Experience Store in China. The handset is going to be showcased at a VR event that is going to take place later tonight. If you guys want to be a part of the event, then make sure that you follow the latest updates coming in at 10 pm EDT in the U.S. Previously, we reported that OnePlus 2 was taken for another benchmarking run, only this time, the handset managed to score quite poorly in AnTuTu. However, we reminded you guys that this could have been a different model carrying the number A2001. The other specifications included a 1080p resolution and 3 GB of RAM. The higher performing model, which has been named A2003, features a 1440p display coupled with 4 GB of RAM. It was also reported that OnePlus 2 would be sporting dual SIM slots, which is a terrific feature for who experience a severe amount of encumbrance while carrying two handsets. As we all know, OnePlus 2 is going to be carrying a sub-$450 price tag, and today we are going to find out everything that needs to be known from the Chinese smartphone firm. Perhaps in the later days, we will be able to catch a glimpse of how Snapdragon 810 present inside the smartphone performs. Like always, we will be providing you with the latest updates so stay tuned for more. The post OnePlus 2 Will Be Scheduled For First Launch On August 8 by Omar Sohail appeared first on WCCFtech.